This morning my outside thermometer read 3 degrees !! This is the coldest morning I have recorded since moving to my new house four years ago, and the first time that I have ever seen frost in my “bottom paddock”. For people who live in colder climates, 3C is nothing much to complain about, but this is supposedly sub-tropical Bellingen, and when you consider that one day last week we recorded 29C – one of our hottest ever August days – it’s all a bit of a shock. Last week lorikeets were hurtling around the garden feeding on early blooms, the mango had started flowering nearly two months prematurely, and I was busy pruning and tidying up in anticipation of Spring. 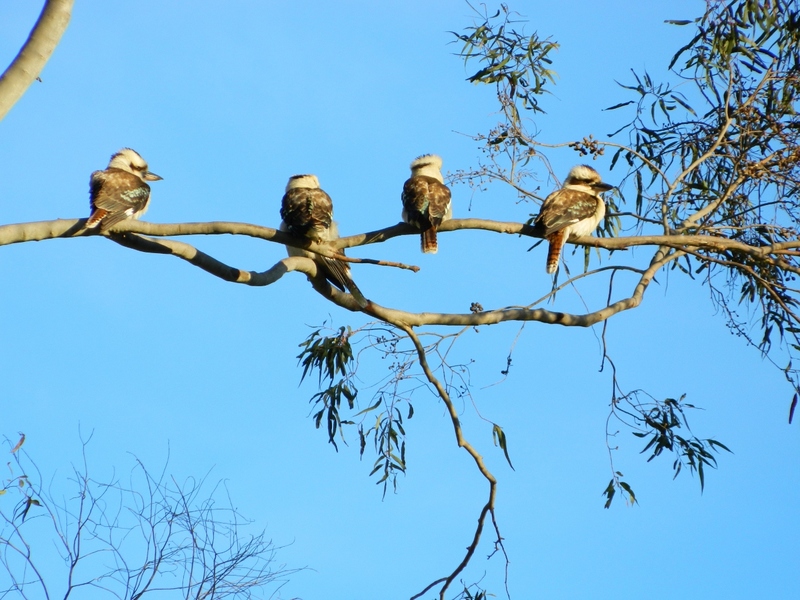 But this morning my family of kookaburras, who usually visit the veranda for a breakfast snack, were hunched up high in a eucalypt trying to catch the early morning sun. As for me, I’m eating my muesli in a patch of sunlight warming myself like a lizard.